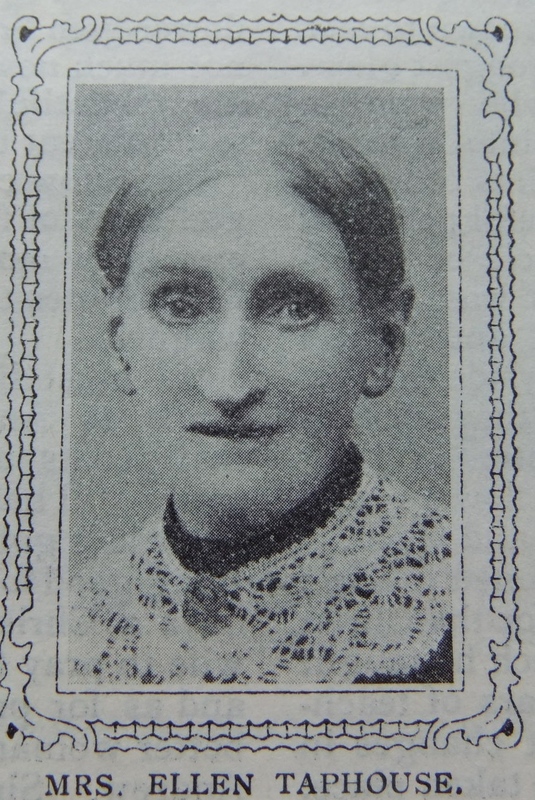 Mrs. Ellen Taphouse is one of the “honourable women” who have rendered useful service to Primitive Methodism. She has been associated with our church from her childhood. 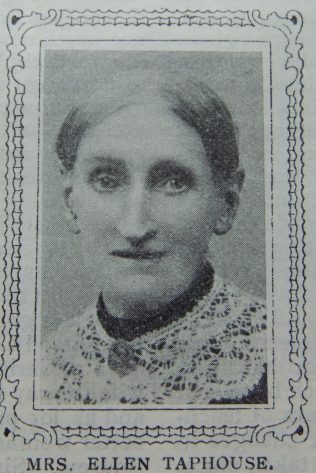 Born in St Aldgates, Oxford, on August 13th, 1826, one year after academic Oxford was “stormed” by W Belham, she was converted early in the “hungry forties” at a service conducted by Mrs. White, in the little chapel at Stanton St. John, then newly opened, and at once became a member and earnest worker of the New Street Society, then in its infancy, Oxford at that time being a branch of the Wallingford Circuit. Her father, Mr. Robert Dingle, was one of the three local preachers who remained in the city after the collapse of the society founded in 1835. The Rev. Samuel West and his helpers found a ready welcome to her father’s house, and services were regularly held there until the opening of the chapel, erected by Mr. Dingle, and rented by the young society in Union Street, St Ebbs, and which was well-known at the time as “the glory hole.” She was for many years a teacher in the New Street Sunday School, her father being the superintendent. On commencing services in St Clement’s, East Oxford, in 1867, she became a member of the new Society, and was appointed Class leader, and migrating with the Society in 1875 to the chapel in Pembroke Street, she has retained her position. Now, though eighty-two years of age, she still shepherds the flock with surprising vigour. She has living recollections of Henry Higginson, Samuel West, W. Brewer, Isaac Hedges, and well remembers Hugh Bourne preaching at New Street. She has been a missionary collector for over forty years, and has collected nearly one hundred pounds for the Mission Fund. Her home has been an open house for the preachers, and it is a great delight to her to minister to the messengers of truth. She loves the Lord’s House, and is seldom absent, and is strongly attached to the prayer meetings. The subject of this sketch was born Eleanor Dingle on 13 August 1826 to parents Robert and Martha. She was baptised in the Wesleyan Chapel on 29 July 1832. Eleanor married Thomas Taphouse (1818-1895) in the summer of 1848 at Buckingham, Buckinghamshire. Thomas was a journeyman sawyer and later a general dealer (1881). The 1891 and 1901 census returns identify Eleanor working as a laundress. Census returns identify three children. Eleanor died on 28 January 1917 at Oxford.